Research in human development clearly shows that the seeds of empathy, caring and compassion are present from early in life, but that to become caring, ethical people, children need adults to help them at every stage of childhood to nurture these seeds into full development. Fundamentally cultivating children’s concern for others is the right thing to do, recent Harvard research has shown when children can empathise with and take responsibility for others, they’re likely to be happier and more successful. They’ll have better relationships their entire lives, and strong relationships are the key ingredient of happiness. In today’s workplace success often depends on collaborating effectively with others, and children who are empathic and socially aware are also better collaborators. • Help children develop self-control and manage feelings effectively. This Harvard research is not ground-breaking by any means but highlights the shared responsibility we all have in supporting our students grow into caring and ethical people. Malcolm Gladwell further identifies that the circle of influence for our students shifts through their formative years where it is focussed on parents and family, to the adolescent years where their peer group is the biggest influence on decision making and choice. This again shows the importance that all members in the community have in nurturing, supporting and cultivating these seeds in our students. Catholic Education Week will be held the week of the 18th to 24th March. 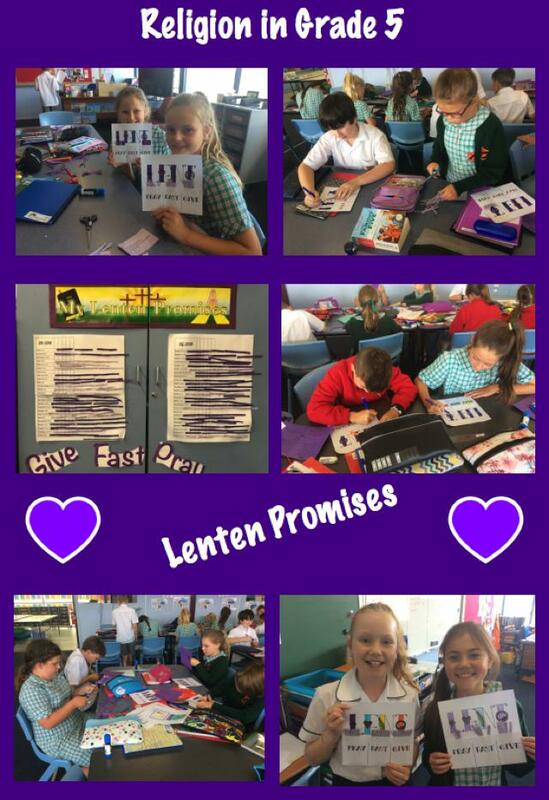 To celebrate this week we will launch our Archbishop’s Charter response, senior student leaders will represent our school at the regional Mass at St Mary’s Cathedral and we will be holding our Caritas K’s Walkathon. In launching our Archbishop’s Charter we will be holding a Student Summit at school to collect the feedback and insights from our students to assist us in responding to the Charter. Areas of focus will be Catholic identity, learning and the playground. Parents will also be asked for feedback as well. Further details around the Student Summit will be shared in next fortnight’s newsletter. Thank you to all families who have made the time to meet for our first Parent/Teacher Conversation this afternoon and tomorrow. We thank all parents for their time in supporting us in developing this partnership through our Parent/Teacher Conversation. While parents are encouraged to discuss student progress with their class teacher at anytime, the final formal Parent Teacher Conversation will be after the Mid-Year Report at the end of Term 2. Archbishop Julian Porteous will lead a Mission Evening to be held in the Parish Church this evening, Wednesday 28th February, commencing at 7:00pm and concluding by 9:00pm. The Mission Evening is an initiative of the Archbishop, who will give the mission talk. The evening will include song, testimony, preaching, adoration and prayer. • There is a spread across responses. It can be difficult to find middle ground when one response would like to see the cost of booklists increased for the school to complete all of it in order to reduce having to deal with a supplier, while the next response would like flexibility to source cheaper items elsewhere. • Comparisons are naturally relative and compared to our last experience. While it was overwhelming clear that a new supplier was preferred, the preference to this was the previous model we experienced due to its success. In discerning the feedback the main themes shared were communication, volume of deliveries, capacity to stock online when available in store, for families with more than one child all items were mixed together, consistency with items and distribution to school. To honour the process we have provided Officeworks with this feedback and had a discussion around areas for further enhancement. They were aware of many of these areas for improvement and were thankful for the feedback. • We will engage with different suppliers to see if they can meet our need for 2019. This will commence at the start of Term 2 and be communicated to parents by the end of Term 2. • Booklists will be cross referenced and streamlined internally to ensure consistency with items so that they can be reused or shared over years, eg whiteboards. If suitable, these will be school purchased and not through the booklist. • Booklists will be communicated to parents at the start of December and will include class letters for labelling. Class letters will come directly from the school and not through the supplier. • Stationary resources will be resourced better, eg if glue sticks are required they can be bulk purchased through the school and made available in the classroom for students, rather than glue sticks being labelled, collected and then re-distributed. This will save cost through bulk purchasing and save time through immediate student access. 1. Shared Communication Day: Commencing today, our shared communication day will be Wednesday. This means all our class emails and information will be shared with families on Wednesdays. This is designed to assist busy families to know when to look out for key communication and reduce the tension for families in knowing when something will be communicated. The only exception to communication outside of this day will be health or emergency communication which needs to be delivered in a timely manner. Funeral reminders about the Car Park will also be an exception. • We still expect direct communication to come directly to us, not on Facebook. If we had a concern for your child we would communicate this to you directly in a respectful and professional way, not through Facebook. If you have a concern with us we expect this would be communicated to us directly in a respectful and professional way, not through Facebook. • We have a responsibility to model to our children how to resolve conflict or concerns. This is not through Facebook but raising them directly with the person they are concerned with and talking with them. While these protocols may appear common sense to many, we do state them as a reminder to all in our community. There is an enormous benefit in sharing how Facebook can celebrate learning and provide families with clear learning intentions of what is happening in classrooms, to further engage and enrich conversations at home. We thank parents in advance for their support with this. This will be up and operational by the start of next week. 3. Access for Learning: There was a shared thread through the feedback of the need to see student learning in action. General Information Evenings were viewed as unnecessary, unless they respond to need, eg Grade 6 Camp Information Evening. While our Facebook page will start to open the door to learning conversations at home, more personalised learning journeys are being trialled this Term in Grade 2 through ‘Seesaw’. This action research cycle undertaken by Grade 2 will provide feedback to the rest of our staff on this model in sharing learning intentions and documented learning. Further outcomes will be shared at the end of Term 1 from this action research in Grade 2. 4. Paperless: All communication is preferred paperless wherever possible. This provides immediate access and ensures it reaches parents and families. The use of Google Forms to collect information was also identified as a positive step forward. The website, email and newsletter were all received as positive communication tools. • Advertising, marketing and branding. Party Responses to Catholic Education Requests here. Our Grade 3-6 Swimming Carnival will be held this Friday 2nd March at the Clarence Pool, commencing at 10:00am and concluding by 2:00pm. Further details have been circulated to families. The program and the swimming information form can be accessed on the school website "In the School Bag". A reminder that supervision before school commences at the Grade 3/4 Ampitheatre from 8.15am. From 8.25am classroom doors are open and students may enter classrooms. Any students unsupervised before 8.25am must be at the Grade 3/4 Ampitheatre. Mr Marty Ogle will visit our Grade 6 students this Monday 5th March as part of a MJR (Making Jesus Real) visit. Our Grade 6 students focus on MJR as part of their RE and Marty’s visits further compliment this concept. Over the next 2 weeks some teaching staff will take part in Network Meetings. Network Meetings are facilitated by Tasmanian Catholic Education Office staff and focus on strengthening evidence based practice through learning clarity and inquiry cycles. Network Meetings are held twice a year and staff attendance is balanced out throughout the year. Co-Teachers will assist in the relief of class teachers where possible to ensure the continuity of the existing learning program. One of our commitments as a school community is to provide camp experiences for our students. The purpose behind these is to build on teamwork, leadership, communication and school spirit. As a school we feel these are best experienced at the start of the year to also assist class and grade formation. Our Grade 5 Camp will be on Wednesday 14th March to Friday 16th March, and Grade 6 Camp will be from Tuesday 10th April to Friday 13th April. We take this opportunity to not only thank families for their support and preparation in assisting us provide these experiences for our students, but we also acknowledge the willingness of staff in their organisation, planning, involvement and energy in each camp. It is often assumed that Teachers get paid extra or are provided with other incentives to provide camps. This is not the case with each Teacher being motivated only by the value the experience is for each child. We thank all our staff involved in the camps as they organise their time outside of school to provide these wonderful experiences. All Grade 6 parents are encouraged to attend our Grade 6 Camp Parent Information Meeting on Thursday 15th March at 7.00pm in Grade 6. While all forms, consent and details have been previously distributed, this meeting will provide an opportunity to clarify final details and responsibilities ahead of our Grade 6 Camp to Canberra. The Tasmanian Catholic Education Office allocates one Pupil Free Day during the school year for staff professional learning. All Catholic Primary Schools have been allocated Monday 23rd July as our Pupil Free Day for 2018. We appreciate that this may impact on childcare for families so provide this advanced notice. Monday 23rd July is the first day of Term 3. Please note as per last year, the day after Hobart Show, Friday 26th October, will remain a pupil free day. If you have any questions, concerns or queries please do not hesitate to contact us. The 2018 Play and Learn Program for 2 to 4 year olds commenced on Tuesday, 20 February. Sessions run from 9:30am to 10:30am in Ballygriffin House. Further information is available here and also from the School Office. FEE AND LEVY ANNUAL INVOICES will be issued on Friday, 2nd March 2018. A $70.00 per child DISCOUNT will be applied to ANNUAL payments where payment is made by no later than Friday, 30th March 2018. If paying by BPAY, the payment must be received into the School’s bank account by Friday, 30 March 2018. The first Scheduled monthly and one off annual EFTPOS payments will be processed on Tuesday, 13th March 2018. The first scheduled monthly DIRECT DEBIT and one off annual payments will be processed on Friday, 16th March 2018. The Canteen is open on Fridays again this year. Please check the menu as there are a few changes. Canteen Menu. Subway will be a monthly option and the dates for Term 1 are - 23rd March and 13th April. The Qkr app is the easiest option to purchase items, but brown paper bag orders are still acceptable. • Tasmanian Association for the Gifted Inc.